Saracen Militia are richer townsfolk who have been levied into militia to guard their settlements. Better trained and equipped than most militias, these troops are armed with a spear and protected by mail. 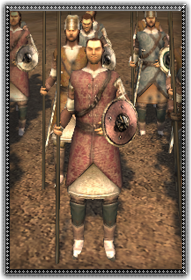 These are townsfolk who can look after themselves on any battlefield, useful for bolstering armies, with good defence against cavalry.